I love transforming smiles and seeing patients leave our office with newfound confidence. 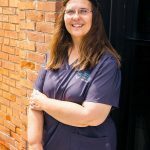 As a member of the dental team, I do mostly chair side assisting, but have also served in many other capacities during my 33 years of experience. I consider my most important responsibilities to be educating patients in treatment planning and post operative care and making them comfortable during their visits to our office. I am a certified dental assistant with expanded functions credentials. My educational background includes Iowa State University and an AAS from Kirkwood Community College in Dental Assisting. Currently I am serving on the advisory board for the dental assisting program at Indian Hills Community College. I live on a century family farm north of Keota where my husband and I operate a grain and livestock farming operation. We have three grown children; two sons and a daughter. When I am not peering into someone’s mouth, I can be found reading, quilting, cooking, or tackling one of my many home improvement projects.